The past few weeks have been a steady stream of depressing news stories, mostly reporting the terrorist activity in Boston, tragic explosion in West, Texas, and legislation disappointment in Washington. When we are glued to televisions and subjected to endless musical photo montages intended to rope us into a particular station's coverage, the world looks dark and hopeless at best. When reporters ask passerbys and rescue workers questions that exploit their raw emotions, we wonder how long until the world is once and for all put to rights. When that same week our political leaders choose to kiss the billion-dollar rumps of lobbyists instead of embrace a bill that will make the world safer for everyone, especially our children, we feel powerless against violence and injustice. We wonder why we need background checks to run a daycare but not to own a semi-automatic purchased at privately-organized conventions. If we are not careful, we can become slaves to cynicism. 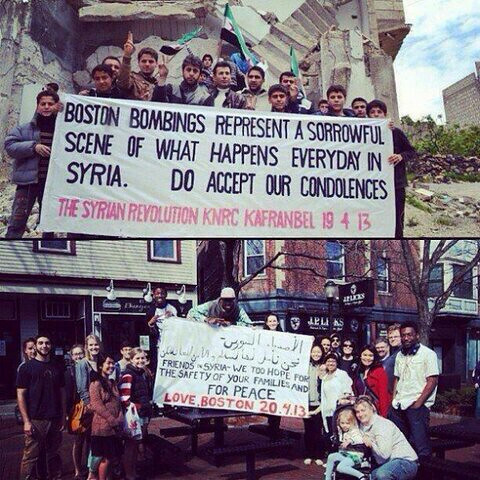 And when photos trend on Facebook and Twitter, reminding all of us that events like the Boston bombing happen everyday in Syria, it doesn't make us feel any better. We actually wonder, can anything good come out of a world so saturated in heartache and sorrow? This past week, Imago Dei Youth worked through the call story of Nathanael (John 1:43-51). Jesus had just captured the hope and imagination of Philip who became bent towards sharing this good news with his friend from Cana, "We have found the one we have been waiting for" (1:45-46)! "Can anything good come out of Nazareth?" retorts the jaded Nathanael. God has a habit of bursting good news of redemption and hope in the midst of the darkest, drearist, dullest, and most forsaken circumstances, people, and places. The coming of the world's deliver was no different. Still, our questions today echo those of Nathanael, whose name means "God has given," can anything good come from ________?" I don't think it is appropriate to pose this question to those who lost limbs or loved ones to terroist activity, homes and rescue workers to fertilizer fires, or children by guns easily purchased by killers. It's too raw and misses the opportunity to grieve with those who grieve. While God certainly can and often does resurrect goodness out of the worst of human suffering, we must not think for a second that God intended any of this to happen for some sort of divine purpose or affirmation of sovereignty. I believe God wants this horrific activity to end. I believe Jesus announces to the world, it doesn't have to be like this. I also believe when we embrace the Way of Jesus and the dreams of God as our very own, we dicover we are not powereless, things can be different, and good news can pop up all around us even when our minds are numb by so much bad news. Divine traffic, a holy collison of sacred messengers, rooted in this Human One called Jesus, Messiah, Immanuel, God with Us. It's as though Jesus were saying, "What you'll see from now on is the reality towards which Jacob's ladder, and even the Temple itself, was pointing like a signpost. If you follow me, you'll be watching what it looks like when heaven and earth are open to each other." (N.T. Wright, John for Everyone 18). In the midst of all the evil and injustice of this world, heaven and earth are still open to each other. God's love and concern are still deeply connected to the world and each one of us. Signposts are being constructed and illuminated everywhere as people live into the kingdom of God and offer their very lives as testament to the simple truth: love always wins. The story of Nathanael is an invitation to come and see, follow Jesus, and join the holy traffic as you grasp rungs of hope and grace- even in the midst of the darkest of days. And may we never be slaves to cynicism or fear. As a part of the youth conversation, we wrote signs of heaven and earth being open to each other. Here are a few that caught my attention, and a few I added, which have carried me through these weeks. Maybe make your own list in the form of a ladder, grasping these rungs of hope during your own seasons of despair. When youth in Honduras walk 4.5 hours through the mountains to catch public transportation and be a part of youth retreats and workshops where they learn about and worship Jesus alngside their fellow believers. People rushing to the scene in Boston and West, Texas, willing to risk their lives to save another. Broad Street Ministry and their solidarity and hospitality offered to the poor and homeless o Philly. Young children entering remission after long battles with cancer. Watching a middle school youth finally make it to the top of a rock climbing wall and high-fiving his youth pastor after repeated failed attempts and nearly given up. The joy and love for life my kids demonstrate every single day. When advocates and lawyers develop propositions to solve corruption in Honduras police forces. The work my wife does to support and rehabilitate homeless women who are veterans. When I meet with new friends in Coatesville who share about their ministry alongside at-risk youth. When a high school youth sells all his violent video games and declares he wants to be God's peacemaker not agent of destruction. *I wonder if John chooses to use the name Nathanael versus Bartholomew, as in Matthew, Mark, and Luke, for this very literary and metaphorical platform?